With a bacon post last week and a pancetta post this week and the pork belly banh mi sandwich I had for lunch earlier this week, I might be going on a pork fast in the near future. However, in the mean time, I intend to fully savor these risotto pancetta cakes with sun-dried tomato pesto. With a crunchy panko coating on the outside and a creamy center of parmesan risotto dotted with bits of pancetta and parsley on the inside, these risotto cakes will make for a delicious appetizer at your next dinner party. Plus, there’s the homemade sun-dried tomato pesto on top that really makes this dish party-worthy. This recipe is another one from Chef Jami Martino, my friend who teaches a culinary course at Houston Community College. You can read all about the gourmet lunches her culinary students prepare each week during the spring semester here and here. Jami is always kind enough to share the recipes from the lunches with me and they are always fabulous. These risotto cakes were one of my favorites from the last lunch I attended and once I realized how few appetizer recipes I had on my website, I knew this was the recipe to make next. The recipe does require several steps so I wouldn’t recommend trying this for a weekday dinner but it’s perfect for a party. You can break up the steps to make things easier. The sun-dried tomato pesto can be made several days ahead and stored in the refrigerator. The risotto can be made and shaped into patties 1 day ahead and stored in the refrigerator until you are ready to fry them. The day of the party, coat the cakes and fry them. You can fry the cakes immediately before you plan to serve them or fry them ahead of time, keep them at room temperature and then reheat in a 375-degree oven until hot. 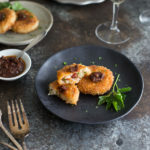 These risotto cakes work well as either finger foods during a cocktail hour since they are easy to pick up and eat in a few bites or they can be served on small plates as a first course. They also work as after school snacks for a hungry teenage daughter who devoured at least eight of these when she came home yesterday (i.e. when your mom is a food blogger, you get interesting snacks). Preheat oven to 400 degrees. Place pancetta in a single layer on a rimmed baking sheet. Bake pancetta until crisp and nicely browned, 12 to 15 minutes. Drain pancetta crisps on paper towels. Let pancetta cool and then roughly chop it. Set aside. In a saucepan over medium heat, bring the broth just to a simmer and then keep it just below a simmer over low heat. In a large sauté pan or dutch oven, melt the butter over medium heat. Add the onions and sauté until onions are soft, about 3-4 minutes. Add the rice and cook, stirring until grains are evenly coated with butter and are translucent at the tips, 2-3 minutes. Slowly add 1 cup of the hot broth to the rice. Keep the heat under the rice so that the broth is at a low simmer once it is added to the rice. Stir until broth is almost completely absorbed. Continue to add broth to the rice, ½ cup at a time, stirring constantly until the rice is al dente and looks creamy, about 20 minutes. You may find that you do not need all of the broth or that you need more. Remove the risotto from the heat and stir in the white wine, Parmesan cheese, parsley, and chopped pancetta. Season with salt and pepper as needed. Spread risotto evenly onto a rimmed baking sheet. Refrigerate the risotto until it is cool and firm. Shape the risotto into 24-30 small patties. Set aside. In a shallow dish or pie pan, add the flour. In a second shallow dish, whisk together the eggs and milk until blended. In a third dish, toss the the panko breadcrumbs with 3 tablespoons grated Parmesan cheese. Working with one risotto cake at a time, dip the risotto cake into the flour to coat evenly, shaking off the excess. Then, dip into the egg mixture, letting the excess drip back onto the dish. Then coat the risotto cake in the panko breadcrumbs, patting firmly to help the breadcrumbs adhere. Heat ½ cup oil in a 10-inch non-stick or well-seasoned cast iron skillet over medium-high heat until it shimmers. Working in batches if necessary, carefully place the risotto cakes into the heated oil in a single layer. Cook until the undersides are golden brown, about 3 minutes. Turn the slices and fry until the other sides are browned, about 3 minutes more, adding more oil to the pan as necessary. Drain the risotto cakes on paper towels. Put the basil, tomatoes, garlic, pine nuts and parmesan cheese in to the bowl of a food processor. Pulse until all the ingredients are all finely chopped, scraping down the side of the bowl as necessary. With the processor running, slowly add the olive oil and process until an even textured paste forms. Add more olive oil, as necessary, if the mixture is too thick. Season to taste with salt and pepper. Place the desired number of risotto cakes on serving plates and top with a dollop of pesto. Sprinkle with finely chopped parsley, if desired. Pass the extra pesto around at the table. The pesto can be made ahead of time and stored in the refrigerator. Bring the pesto to room temperature before serving.